Dubai: Emirates has just completed the revamp of the second aircraft in its fleet and it’s letting people in on how it’s done. In a video released on Thursday, the airline takes viewers to the behind-the-scenes of the intricate process of reconfiguring an aircraft, from stripping the old interiors to re-wiring the lighting system and fitting the new seats and amenities. The original interiors of the aircraft are completely stripped and rebuilt. The airline is spending $150 million (Dh550 million) in its refurbishment programme to redo ten Boeing 777-200LRs in order to offer new, wider seats. The new seats being installed in the business class cabin. So far, two planes have already completed the reconfiguration and one of them was already deployed last March 2018. In order to offer ample space to customers, Emirates is getting rid of the first class aboard the ten Boeing 777 jets, so that means there will only be business and economy class seats on the revamped aircraft. This enables engineers to reconfigure the business class seats in a 2-2-2 format, create a new social area in business class and refresh the economy section. This also effectively raises the ceiling height in the business class cabin. A technician re-wires the lighting system of the aircraft. After all the reconfiguration work is completed, this is how the new business class cabin looks like. 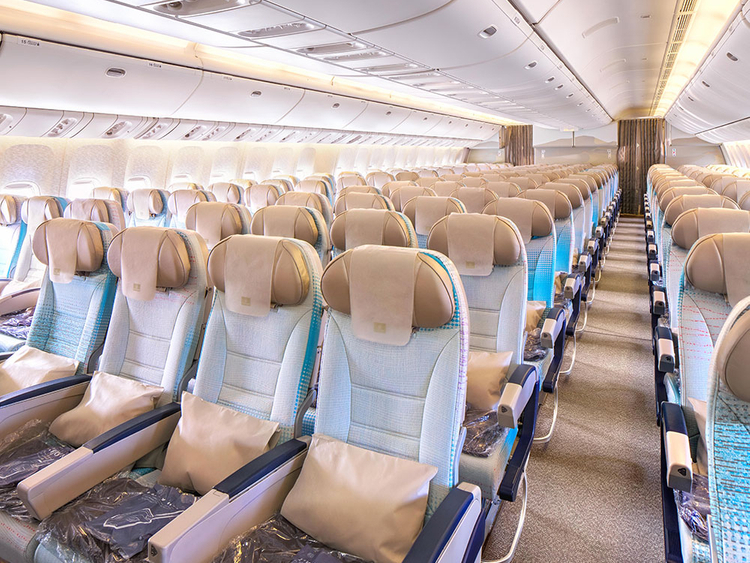 And here are the new and improved economy class seats aboard the remodelled Boeing 777 jets. The airline expects to complete the makeover of the remaining eight planes by mid-2019 and these will be deployed to key destinations, including Santiago, Chile. All the reconfiguration work is being done in-house, at the Emirates Engineering hangars. When Emirates worked on the first aircraft lined up for the refurbishment programme, engineering crews spent 55 days to complete the makeover. With the second aircraft, the reconfiguration was completed in only 35 days.